Do my loyal followers ever get tired of hearing how much fun stuff there is to do in this area? Maybe it sounds like I’m a broken record but it’s simply fantastic to have so many options of activities. Living in Panama last year was an excellent experience but it was a little light on the variety of activities (read: you can go to the beach… then there’s the beach … and oh yeah, there’s the beach again). 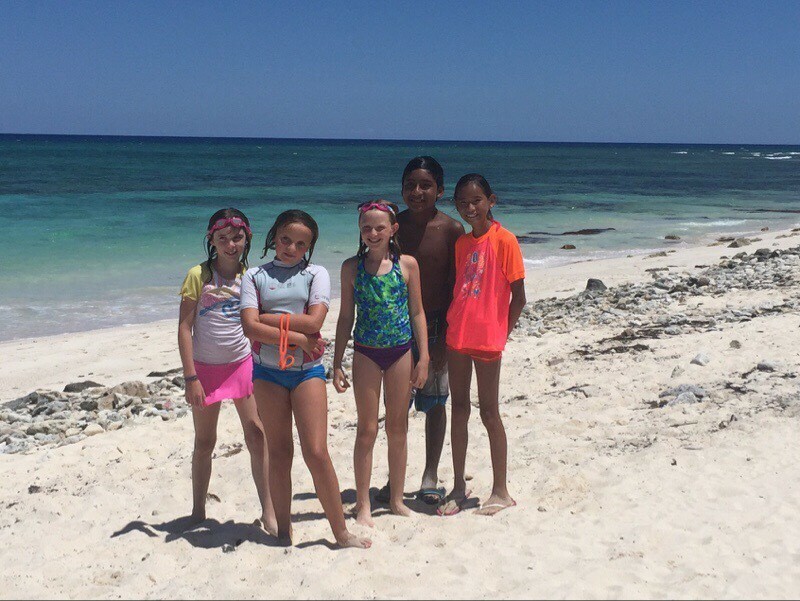 But here in Mexico we have regular meet-ups with the other homeschoolers around the Riviera Maya, and every week we go to a different place. 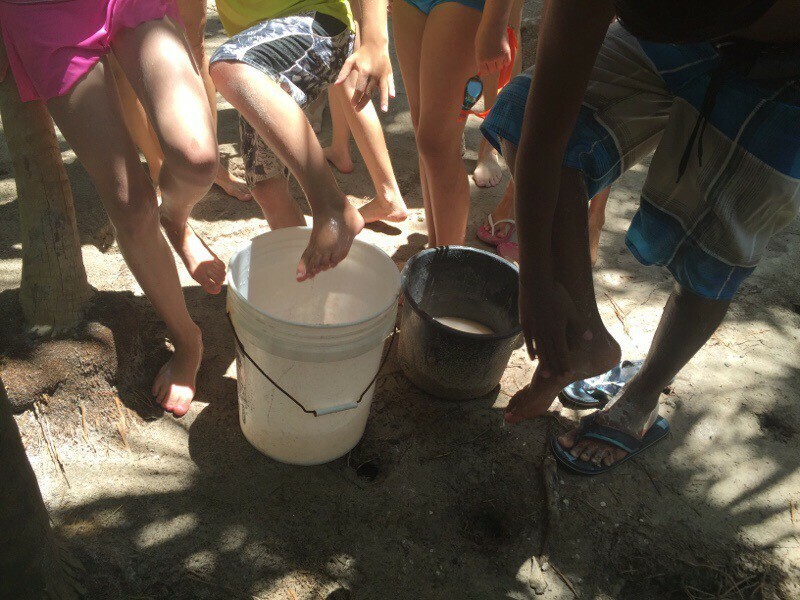 The group is a combination of locals who homeschool, expats who are passing through and everyone in between. It’s an ever-changing group of people but that’s part of the fun. Of course the kids (and moms!) just love hanging out together. 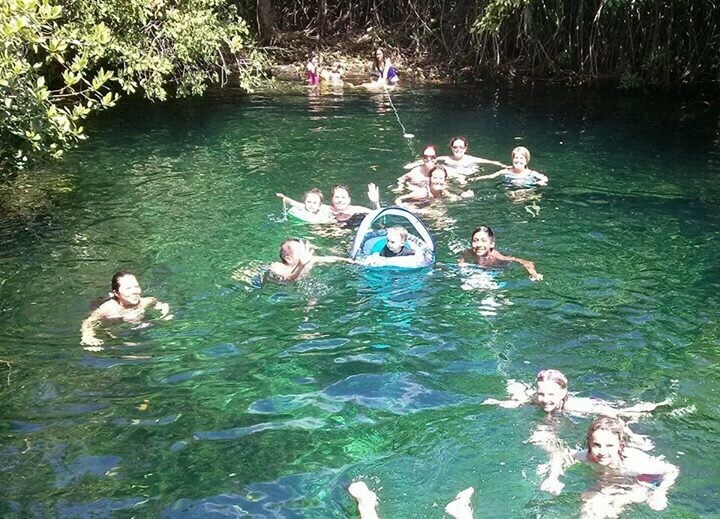 This week the meet-up was at a beach and cenote called Xcacel, which is south of Playa del Carmen. It was a bit of a longer drive for us but we are getting used to that road and it’s a very straight shot from Cancun, so off we went. 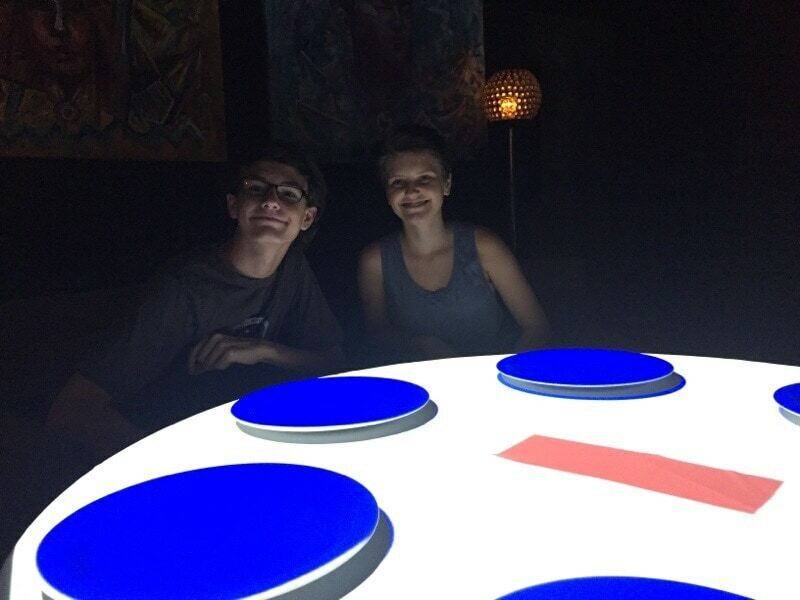 Haley opted to spend the day in Playa del Carmen getting a haircut and then hanging with fellow video-game-fan Justin. 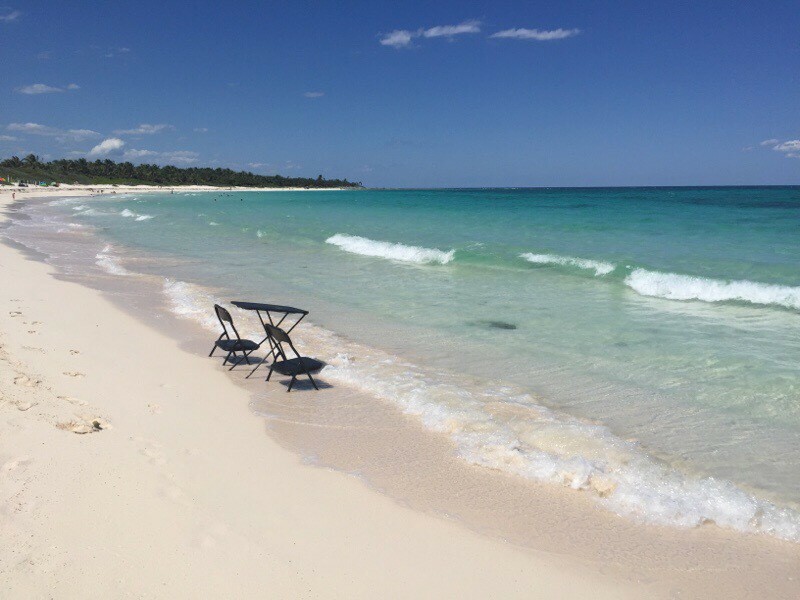 Dan opted to spend the day in Cancun with the quiet house alone with the bandwidth. That’s just fine because Zoe and I, the extroverts, were happy to have our social time without those pesky introverts asking when we were going home. After dropping Haley at Justin’s house, Zoe and I did the Playa Shuffle, which is the ever-present series of missed turns that we take when finding a new place in Playa. 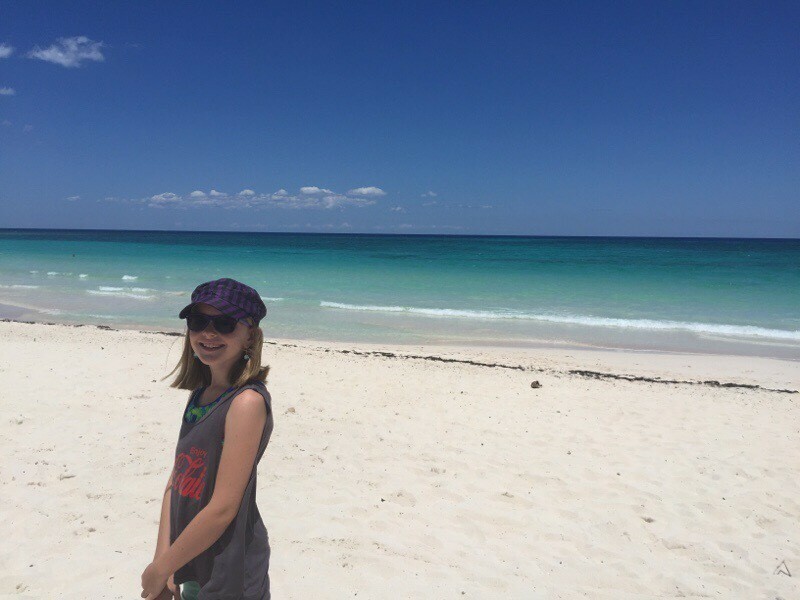 We passed the turn-off road to Xcacel a few times but we finally found it with Zoe’s navigational assistance (Worldschooling in action – count that as a map reading lesson!) and we turned in at the big sign that had a turtle on it. Turtles? Whaaa? 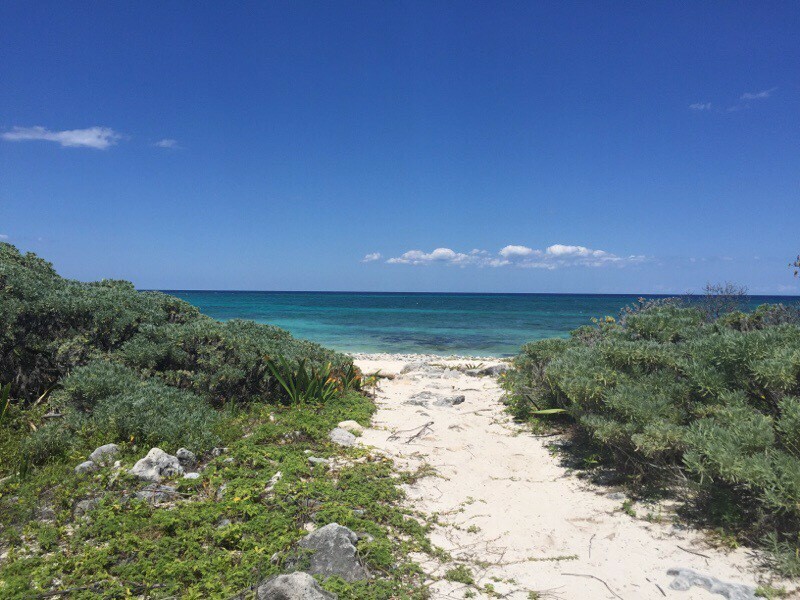 What do turtles have to do with this beach and cenote? More on that later. 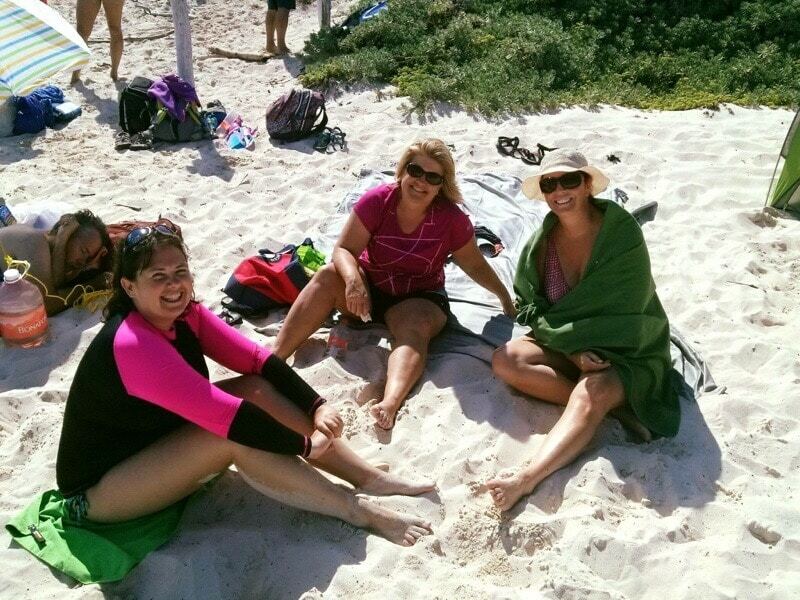 The beach was…. simply gorgeous. The sand was so fine and soft, the water was shallow and very blue and the waves were very calm. It was the perfect combination for the kids. There was not any shade but most people brought their own tents. And the facilities were great too: the parking was very close to the beach, and they had bathrooms and rinsing showers. And it was only 20 pesos to get in (about $1.11US). 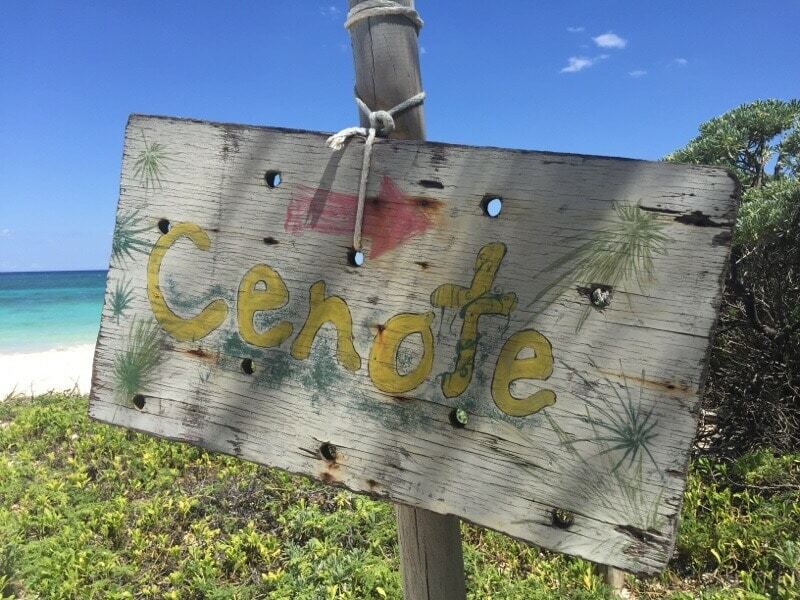 And on top of that… there was a cenote!!! I really appreciated the efficiency of mother nature, putting a cenote right next to a beautiful beach. It’s too bad it came at the expense of the poor dinos. 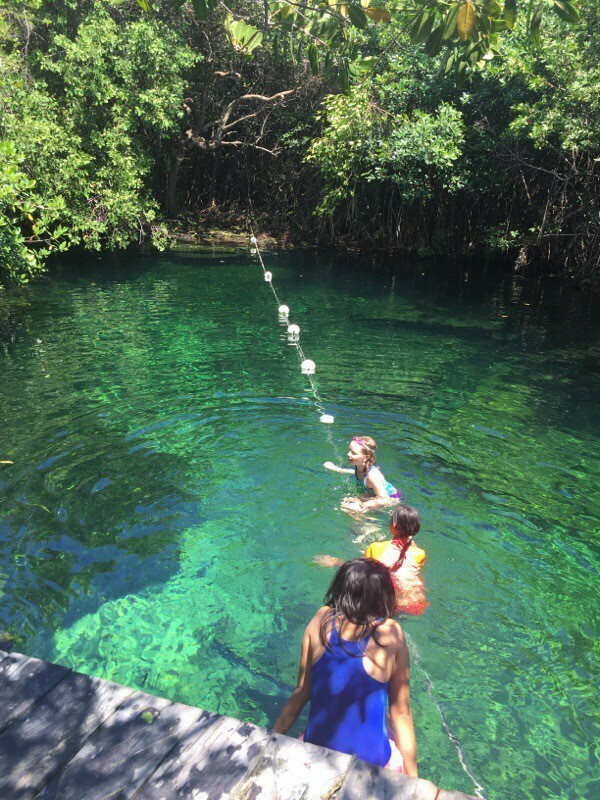 If you’re wondering what dinos have to do with cenotes, see today’s Worldschooling lesson at the bottom of this post. So after a bit of playing in the surf we trekked over to the cenote which was about 100 feet into the jungle. There was a nice little boarded walkway that looked like you were going deep into the jungle and suddenly the cenote appears! It was clear, a little chilly when you first got in, deep and somewhat small. It was not the best cenote due to lack of a zipline and no decent jumping platform but it was very nice and the proximity to the beach really makes it unique. And the kids managed to jump from the corner of the dock anyway. There were little fishes in the water that liked to nibble on you and for the most part they didn’t get you if you kept moving. But even if they did it didn’t hurt most of the time. People down on 5th Avenue in Playa del Carmen pay $15 for these fishes to bite their feet for 15 minutes and here we were getting it for free! 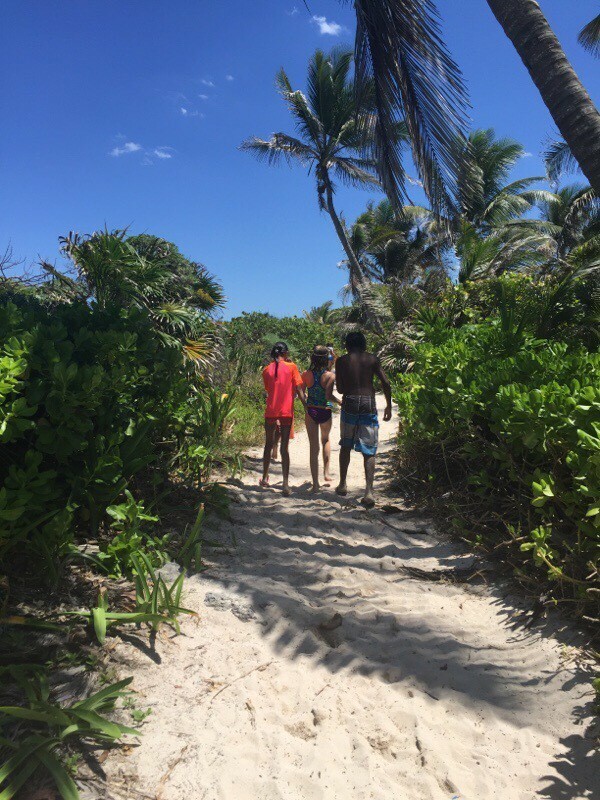 After we grew tired of treading water and being fishy food we headed back to our spot on the beach and the kids played and played and played. Zoe really connected with some kids of a new friend of mine and I connected with some new expats. Zoe and I filled our social cup and declared it well worth the navigational lesson it took to get there. At 4:45 the lifeguard came around blowing his whistle and told us the beach was closing. What? A beach closing? How does that work??!! Well turns out they need us all to leave due to the…. TURTLES! Yes! Turtles! At some point after 5 p.m. the turtles come up and lay their eggs and this beach was a protected spot for them so we all had to leave. I had to know more so I took down the name of the place and learned that it’s a turtle conservation group and they do tours at night where you can watch (carefully, quietly) the turtles lay eggs or, at other times of year, you can watch the baby turtles hatching and going out to sea. Insert jaw hanging open here. We must do this!!! So that was a great discovery and soon we will be figuring out the best time of year to reserve a very limited spot with the turtles at night. Zoe and I then met up with Haley at our friend’s house in Playa. We got cleaned up and headed down to 5th Avenue for dinner. We decided to go to the Frida Kahlo restaurant. Frida Kahlo is Mexico’s most famous artist and there is a unique restaurant dedicated to her work. 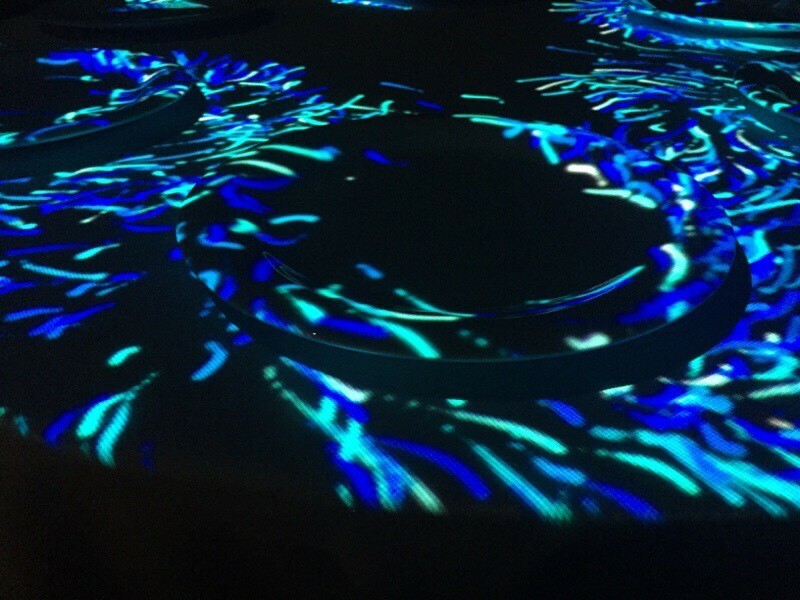 It has an interesting experience called Gastro Mapping which is, in simple terms, a light show on your plate. It’s a little odd. It sounds like a medical procedure to me. The restaurant was very nice but the entire process was a little strange. We got seated and started exploring the menu. Haley had one in Spanish and she told me she couldn’t really understand what the entrees were but not because of the Spanish but because they made no sense in any language. I had the English menu and I couldn’t really understand it either! But we managed to find a few things to order even though they all had ingredients we didn’t recognize, or some that we didn’t think belonged in food. About 5 minutes into our menu exploration our waiter told us the “show” was about to start and would we like to accompany him to the 3rd floor. Uh, ok! I was starving so I was concerned about how this might delay getting food into my belly but he said the show was 5 minutes long. So we climbed up to the 3rd floor and sat down at a new table with big white plates. Then there was this light show on our table with pictures of Frida, pictures of her artwork, cool graphics and colors. But no information about her, her life, the inspiration for her work, nothing. Just some music and lights. The show was only about 3 minutes long and when the lights came back on we were escorted back to our eating table. This is very strange. What if we had been in the middle of eating when the show started? Would we have left our food? Would it have gotten cold? Why didn’t you tell us more about Frida? So many questions. Light show on a plate. Its a thing. But we continued with our meal and ended up enjoying our food despite it having ingredients that we didn’t understand. My enchiladas had some kind of flower petal in them. 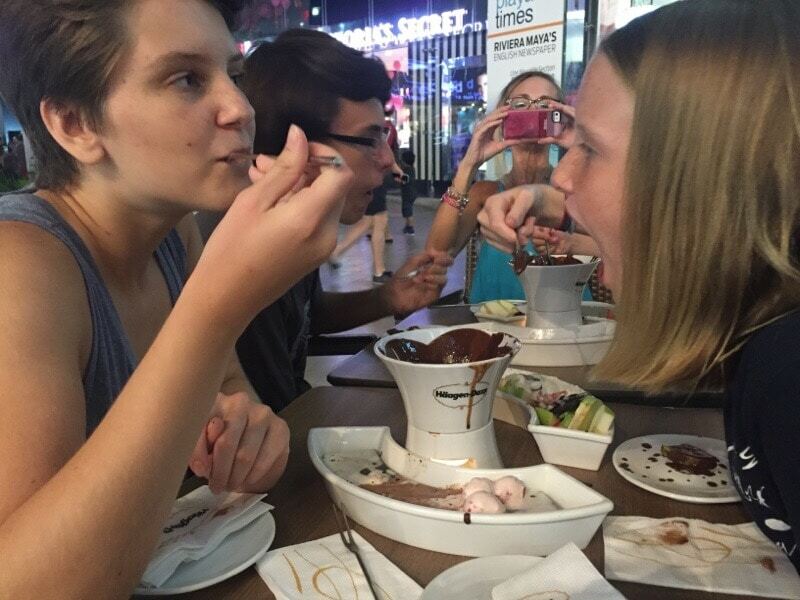 We explored the dessert menu but we all decided the ice cream fondue plate we saw at Haggen Dazs on the way there was calling our names. So off we went to Haggen Dazs. By this time it’s 10 pm and you might know that I turn into a pumpkin at approximately 9:17 pm every night. So here we are just starting our desert at 10 pm and I still had a 45 minute drive home. Yeah, when you have no 9-5 job and weekdays bleed into weekends, some days just get away from you like that. I’m happy to report that the fondue was amazing and we were in a sugar-induced food coma by the time we gazed upon the bottom of the bowl. We made our way down toward our car and noticed that, despite it being close to 11 pm, 5th Avenue was far from quiet. In fact, some street performers were just setting up as we left! It’s such an active place you could literally leave your house with no plans for the day and end up doing things you never expected just by acting on a whim. And don’t think you’ll get home early! But there was no more whim-following for this tired trio. We drove back to our comfortable oasis of a house in Cancun. We stumbled in at midnight, overstimulated and barely coherent about our day, but coherent enough to tell Daniel about it. Daniel told us how he rode Haley’s bike down to the mall outside our neighborhood and enjoyed a burger from our favorite restaurant. 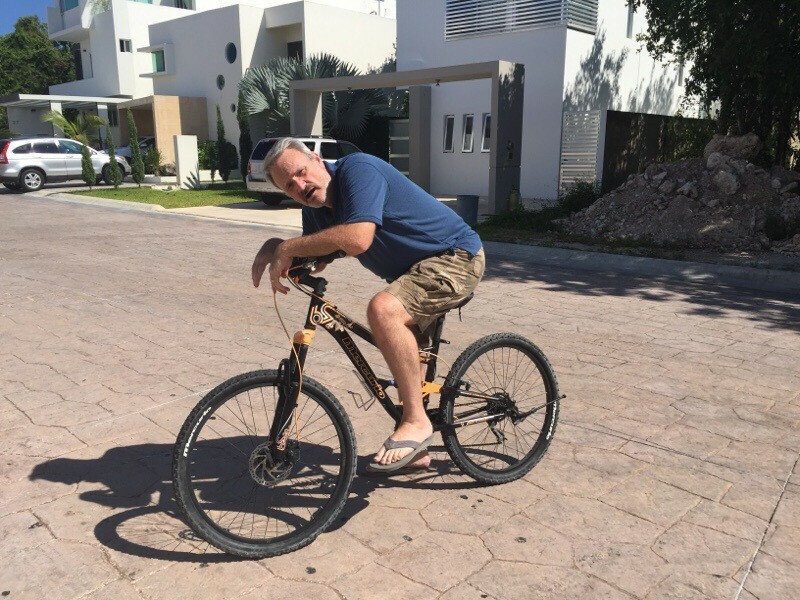 I’m sure the guards in our neighborhood enjoyed the sight of a 6’2″ gringo man on our teenager’s bike. I made him pose for a picture just so you can see it with your own eyes. So, it was a full day: a $59 mammogram earlier in the day followed by 90 minutes of Spanish class in the morning for the girls, then swimming in the ocean and a cenote, a haircut and video gaming with a fellow teen, connecting with good friends and meeting new ones, watching a light show on our plates, eating flower-filled enchiladas and overdosing on ice cream balls and fruit dipped in fondue. It’s all in a day’s life here in Mexico. Es bueno. Next Article How Do You Say “Hissy Fit” in Spanish?